The tour starts on February 24. After their two-match Test series against Sri Lanka, Australia are now scheduled to tour India for a two-match T20I series and a five-match ODI series. They lost miserably against India at home, but thumped aside the Lankans without much fuss. With limited time left ahead of the World Cup in England and Wales, scheduled to start on May 30, the Aussies would be desperate to get their combination in place. In the meantime, they may have been dealt with a body blow as fast Mitchell Starc is likely to miss out on the tour of India. The left-arm speedster is suffering from a soft tissue injury in his upper body. He is currently in incredible form and his omission won’t help the visitors’ cause by any stretch of the imagination. 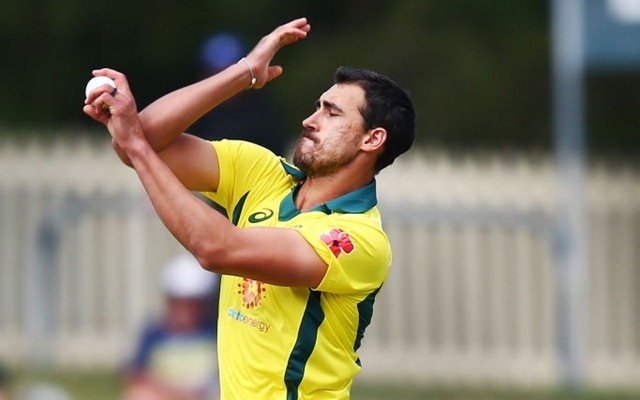 Cricket Australia (CA) will announce the squads on Thursday as per reports in News Corp.
Starc hasn’t had the best of times since the start of 2018. He played a few games against South Africa and then was ruled out for approximately seven months owing to a tibial bone stress fracture. He made a comeback in the two-match Test series against Pakistan in October and looked completely off colour. The New South Wales-born couldn’t deliver in the Test series against India as well. Subsequently, he was a recipient of severe criticism, especially from a few legendary Aussie cricketers. Nevertheless, the 29-year-old didn’t drop his gun and came out all guns blazing against the Lankans. He turned out to be the second highest wicket-taker of the series with 12 wickets at an average of 16.41. He couldn’t quite do well in the opening Test at The Gabba in Brisbane. Nevertheless, the pacer answered all his critics and picked up a couple of five-wicket hauls at the Manuka Oval in Canberra that helped the hosts win the game by 366 runs. He was rightly adjudged as the Player of the Match. As far as the series in India is concerned, the tour gets underway on Sunday, February 24 with the first T20I in Visakhapatnam.